Five hospital visits in less than twelve months. And this was just for one person in our home. It didn’t include the children’s hospital visits for two of my children or the ones for extended memories of my family that crazily all happened around the same time. When sicknesses invades your home, your family, or the lives of those who you have close contact, it can send you reeling and searching for firm ground in an environment that is constantly changing. Sickness brings a level of uncertainty to daily life that can be unparalleled especially for the inexperienced. You may find yourself jumping for the phone each time it rings because it might be the doctor with an update. You are exhausted from a lack of sleep, an overdose of anxiety, and a glut of mental gymnastics contemplating the “what-ifs”. When sickness invades your home, it puts a strain and stress on your family and close relationships and squeezes out whatever is inside. The kindest people can become the meanest, the happiest people can become the most depressed, and even the most patient people can become irritable, short, and sarcastic. 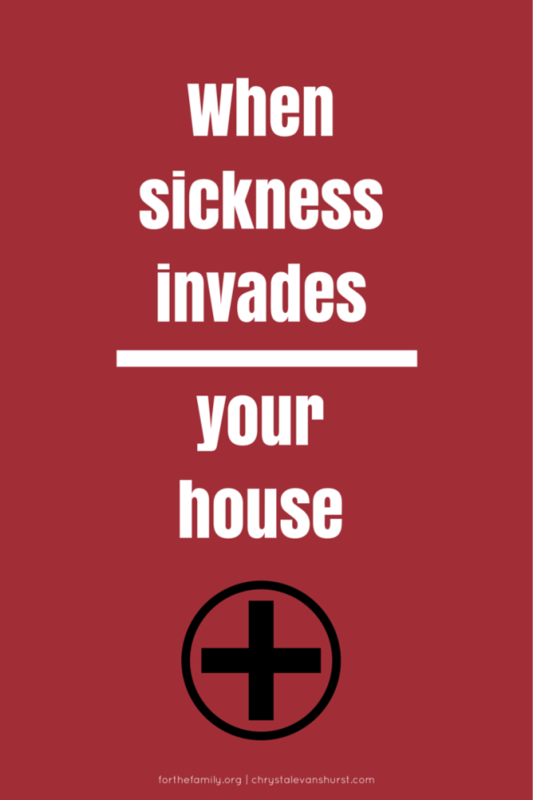 Sickness can turn a home upside down. I have been dealing with health challenges in my home for some time now and while different challenge can present unique difficulties for each family, there are a few tips I’d like to share that might help you… even if it just helps to get you through one more day. It’s tempting to project forward. If we had a choice most of us would choose certainty. We would choose to know what tomorrow holds so that we could prepare for the impact of the worst or look forward to the joy for the best. Unfortunately, we cannot know exactly what tomorrow holds. Even if we think we have a pretty good idea of how the story will end, we don’t know every detail. And it kills us doesn’t it? The good news is that we serve a God who does know. While we wish that He would share every detail with us, in His sovereignty, He choose not to many times and our job then becomes to trust Him – one day at a time. I know that caring for others can be exhausting. And if you are the one who is ill, I know that getting through each day might seem impossible. So when I tell you to love well, I know you might be thinking I’m suggesting the impossible. But when all is said and done – when the doctors have left the room and the diagnosis has been given, love is what holds all things together. When the pain ebbs and flows and emotions ebb and flow with it, love acts can be a balm that soothes even the worst sensations. Love well. Love is what lasts. Remember 1 Corinthians 13:13 says, “…and the greatest of these is love. A frequent result of sickness is that the person who is sick ends up not being the only one who suffers physically. Often the caregiver suffers as well. It is common that those who care for others well do not do as well for themselves. Weeks, months, or years later they crumble physically – worn out from an extended time of self-neglect. It is honorable to serve and love others, however please don’t forget in the midst of taking care of someone else that you should take care of yourself too. Don’t forget that Matthew 22:39 says, “You must love your neighbor as you love yourself.” (CEB) Loving others well flows more fluidly from a person that has a healthy perspective on self-care. Let me close by saying that I’m sorry if sicknesses has invaded your house and things are hard. I wish I could change that for you and for me. But even in the midst of difficult times, one thing is for certain – God can still be trusted. My friend, please know that the love that He has given to each one of us can fill us up, overflow, and nourish others – one day at a time. Insightful article. I’ve been the caregiver for my husband since 2007. We have one son. God has truly blessed us to gracefully weather the storm. I’ve learned so much. Number three in your list has been my biggest challenge that I am just now starting to address. Thanks for sharing this part of your journey. Keep up the great work! You’re bless many people. Thank you Chrystal. It’s the 6th day since my bi-lateral mastectomy and I’m weepy and feeling weak in my spirit. Your words were timely and I know sent straight from HIM to feed me today. God has been my joy and strength through this whole process of the last 6 months. It’s just TODAY – I’m tired of the whole process. You breathed life back into this 65 year old teacher and pastor’s wife. God is good. 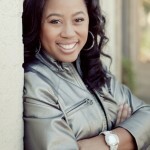 Dear Chrystal, I Praise God for you and Sister Karon who forwarded me your Post. I read it twice, choking back tears each time. I brought my Dad to live in my home 2 years ago. He has Alzheimers. It has been challenging to say the least. I also have a husband and 2 teenage sons. I often feel like I died and loved ones forgot to bury me.. Yet each day I rise with a heart for Women’s Ministry and waiting to see “What God is going to do today and What He wants to do through me. I know I have been “Chosen” for this assignment and desire to please both my Heavenly Father and Earthly Dad, yet I struggle with loving me. God Bless You for these Uplifting Words.